I’ve been itching to wear this Pinup Girl Clothing skirt in an outfit photo for a while! 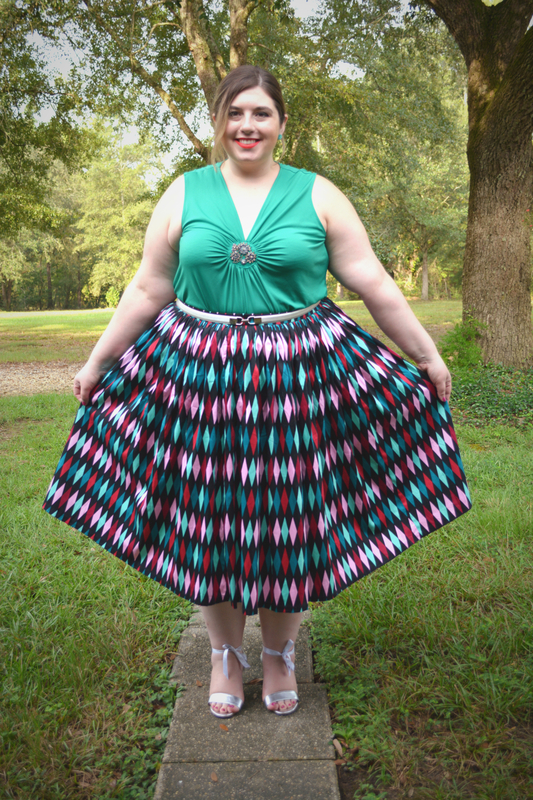 I’ve seen so many bloggers rock their Jenny skirts and dresses in their signature harlequin prints, and I wanted to join the fun! 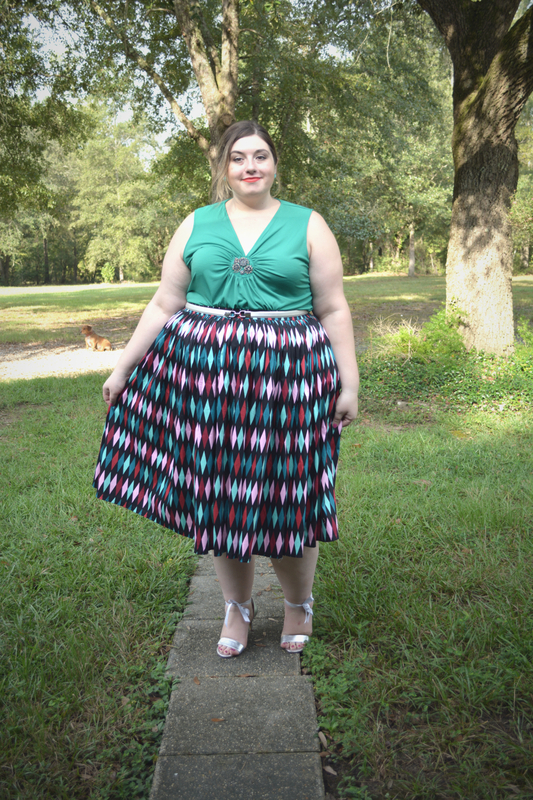 I chose the turquoise print, even though the white colorway also caught my eye; however, that one was only available up to 2X when I ordered (Plus size-ier, please?). I’m happy with my choice, though. I’ve had good experience with Jenny, as you can see from the dress I wore in this earlier post. I’ve had this jewel embellished top for a few years. Because my weight fluctuates, there were times it fit me like a tunic, but now it fits me like this. You have to adapt, right? I did get the this top from PUG in the same print as the skirt. It’s a bit small, tight in the arms and hips, but too big and low-cut in the bust. I kept it still. It has a zipper I can loosen in the back; I plan to wear it tucked in to the skirt and use fashion tape to fix everything up top. Together, the matching top and skirt look like a shirt dress which is way cute. The fabrics used in PUG’s house brands are high quality, but they can also be a bit heavy for warm days. I think I’ll wear both pieces together once the weather cools of. 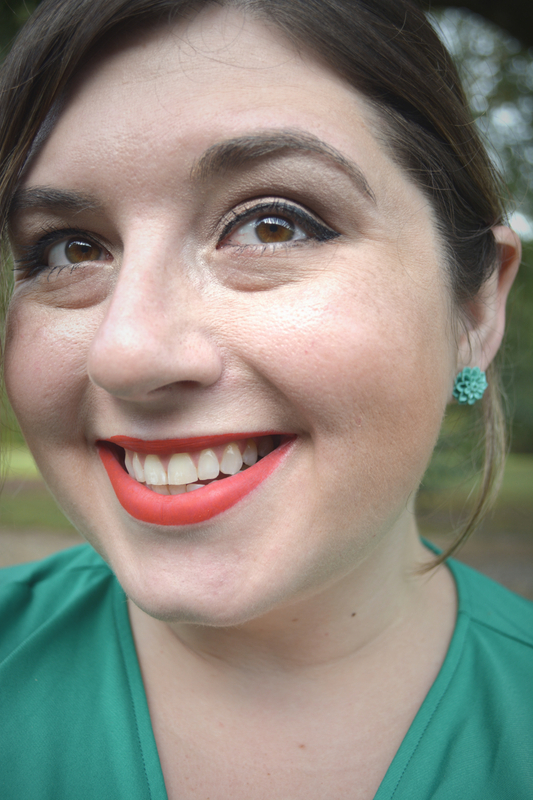 Of course I had to add some retro makeup and earrings! Look at my shoes! They’re kitten heels, so I’m still standing! I bought them to be a bridesmaid in a wedding that has yet to happen. I was disappointed when the ankle straps were too small. At least they are removable, but since the shoes are a bit loose in the heels, I couldn’t do without anything around my ankles. In place of the straps, I used ribbon which worked out great! Now, I’m thinking how cute different types of ribbon would look with various outfits. Can you imagine wider polka dot ribbon tied in the back near the heel? Oh, the possibilities! Extra points if you can spot the doxie photo-bomb in the above picture! How about you all? Have you ever had to adapt a certain item of clothing to “make it work?” Comment to tell me all about your fashion tips and tricks that would make Tim Gunn proud! Thanks for reading, and stay stylin’! I noticed your pics awhile back and this week have finally been perusing your blog. Just wanted to let you know I am enjoying it and your style. I am not only a fellow ‘pluser’ but an Indie fan. I love that you stay true to yourself and have a lotta sass! Thank you so much! Because of the style challenge and getting a new camera, I’ve been inspired to post more.